Surgical minilaparotomy technique of Tenckhoff catheter placement is rarely practiced by nephrologists. There is a scarcity of data comparing technique and outcomes of surgically inserted peritoneal dialysis catheters by surgeon and nephrologist. We retrospectively analyzed 105 Tenckhoff catheters inserted by surgical minilaparotomy (”S” [surgeon], n = 43 and “N” [nephrologist], n = 62) in end-stage renal disease. Comparative analysis of surgical technique, survivals, and complications between both groups was done. “N” group observed two major advantages; shorter break-in (P < 001) and early continuous ambulatory peritoneal dialysis rehabilitation. Cumulative catheter experience was 1749 catheter-months: 745 and 1004 catheter-months in “S” and “N” groups, respectively. “N” group had a better overall catheter and patient survival, and a statistically insignificant mechanical complications, seen mostly in obese and post-abdominal surgery patients, without fatality or catheter loss. Peritonitis rates (P = 0.21) and catheter removal due to refractory peritonitis (P = 0.81) were comparable. The technique used is practical and aids early break-in, yields better results, and later on, helps in easy and uncomplicated PDC removal as and when indicated. Mechanical complications, mostly bleeding, were managed conservatively without any catheter or patient loss. This method should be encouraged among nephrologists and nephrology residents. Choosing of a modality of dialysis is always dependent on the availability, confidence on treatment modality, economics, quality of future life, and dependency on caretakers. Continuous ambulatory peritoneal dialysis (CAPD) is fast getting popularity among patients due to the ease of getting on with activities of daily living and freedom from dialysis unit visits. Percutaneous insertion of peritoneal dialysis catheters (PDCs) is popular among nephrologists owing to the simplicity and ease of procedure; but by far, surgical insertion of PDC by minilaparotomy remains the safest PDC insertion procedure, with very less mechanical complications.,,,, Very few studies are available from India regarding procedural techniques of PDC insertion, mostly being percutaneous technique.,, World over, very few nephrologists use the surgical minilaparotomy method for PDC insertion; hence, limited literature and there is lack of literature comparing outcomes with surgical counterparts. We present a single-center retrospective comparative analysis of PDC insertions by surgical minilaparotomy technique done by surgeon (Group “S”) and nephrologist (Group “N”). We analyzed outcomes of end-stage renal disease (ESRD) patients with surgical minilaparatomy PDC insertions done between January 2012 and March 2015, at a tertiary care government hospital in eastern India and study cohort was followed up for a minimum and maximum duration of 18 and 57 months respectively. All surgical minilaparatomy PDC insertions in patients aged >12 years at this center during said period including obese, prior primarily nonfunctional PDC, post-abdominal surgery, and simultaneous abdominal herniorraphy were analysed in the study. Exclusions were percutaneous and laparoscopic PDC insertions, critically ill, recurrent CAPD peritonitis, and patients with incomplete data entry. There was no crossover between the two groups in case of failure of CAPD. There was no selection bias, as both the operator groups included patients with previous abdominal surgery and obesity. The outcomes analyzed were primary nonfunction of PDC, catheter survival (death censored and overall), patient survival, infection (exit site or tunnel infection, primary peritonitis, and secondary peritonitis), and mechanical complications such as bleeding, peri-PDC leak, catheter migration, flow problems, and scrotal swelling. Standard definitions were used for classifying primarily nonfunctional PDC, catheter survival (overall and censored for patient death), patient survival and peritonitis. Catheter survival assessment was done at 1 month, 3 months, 6 months, 1 year, and at the end of the study period. “Catheter survival, censored for patient death with a functioning catheter,” estimated the probability of catheter loss only and dwelt on the success rate purely in terms of the actual catheter survival. In the event of death with a functioning catheter, the date of death was the date of last follow-up. This fatal event was thereby taken as a case “lost to follow up” and not as catheter loss. Patient death with functioning catheter was taken as catheter loss, as analyzed in “overall catheter survival”. Causes of patient death were death at home due to any cause and death in hospital due to sepsis of any etiology. The term “complication” was defined as, an event which placed the patients' life or PDC at risk and if not tackled at the right moment would have eventually caused catheter loss or jeopardized patient life. We divided complications into mechanical/operative and infectious. Primary peritonitis was defined as peritonitis within 1 month of PDC insertion while secondary peritonitis as beyond 1 month. Attributive relation between catheter/patient survivals, peritonitis with diabetes, catheter-related bloodstream infection (CRBSI), and prior hemodialysis (>1 month) was also assessed. We scrutinized the departmental CAPD registry for CAPD insertions between January 2012 and March 2015 and their follow-up until September 2016 with inclusion and exclusion criteria. The data included details about patients, catheters, operative techniques, duration of catheter functionality, patient survival, mechanical/infective complications and other records. The patients who underwent PDC insertion by surgical minilaparotomy technique were analyzed as Group “S” done by surgeon and Group “N” done by nephrologist. 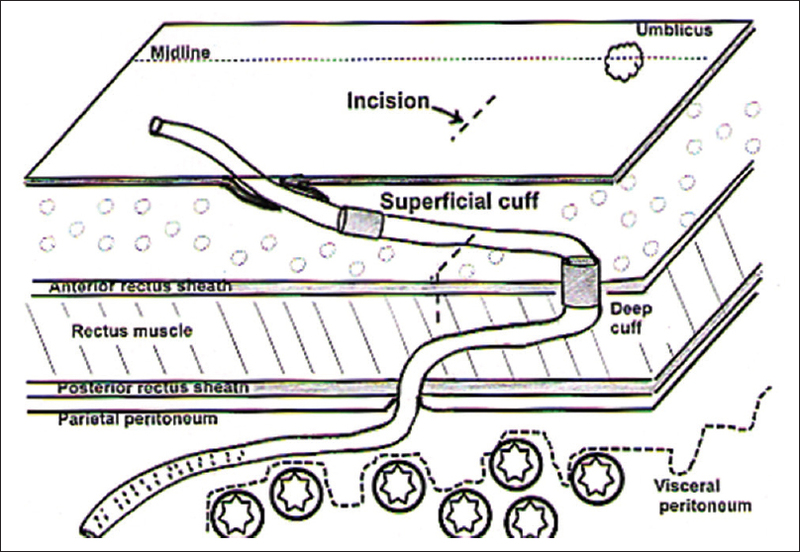 The PDC implantation by surgeon (Group “S”) was done by the classical minilaparotomy technique from infraumblical paramedian incision [Figure 1]. Peritoneum was approached with conventional minilaparotomy technique. PDC was inserted into peritoneum using “Mixter right-angled forceps,” and directed toward rectovesical pouch or left iliac fossa. A purse string was applied at posterior rectus sheath with bite through the deep cuff followed by closure of anterior rectus sheath with PDC (at the lateral margin of the incision). A loose loop anchor to ensure sustained curve of PDC was applied with prolene into the anterior rectus sheath cranially, before entry into subcutaneous tunnel. The surgical placement of PDC by nephrologist (Group “N”), using minilaparatomy technique [Figure 2], consisted of the classical steps of peritoneal approach but with smaller incision. Anterior rectus sheath was incised with 1.5 cm transverse incision, followed by 0.5-1 cm incision made through posterior rectus sheath after separating rectus muscle fibers, to open peritoneum and visualize falling back of omentum and bowels. PDC (with blunt stylet) was slide into the peritoneal cavity directed toward rectovesical pouch or left iliac fossa and purse string applied around the catheter (not through distal cuff). The proximal end of the catheter was brought out through anterior rectus sheath from a 0.3 cm opening made approximately 1.5 cm cranially, and at 30° craniolateral to the entry point of PDC into posterior rectus sheath [Figure 3], and adjusted distal cuff at this opening; this made a natural curve of PDC before its entry into the subcutaneous tunnel. Inspection of exit point to rule out leakage, failed hemostasis, and catheter damage completed the procedure. The statistical technique applied were Chi-square test with Yates correction or Fisher's exact test for comparing two qualitative or categorical variables and Student's t-test or Mann–Whitney test wherever applicable for continuous data. Catheter and patient survival curves' plotting used Kaplan–Meier curves and compared using the log-rank test. The calculation of catheter survival was from day of insertion to the day of catheter removal. Estimation of catheter survival was done as “overall” and “censored to patient death.” Calculation of peritonitis rates was as the total number of first episode of peritonitis for all catheters divided by the total time to that episode of peritonitis and expressed as episodes per catheter-days. Rates were compared using two-tailed Z-tests with the assumption that there would be a probability of a given number of events occurring in a fixed time interval. Relative risk (RR) and odds ratio (OR) was used to decipher any relation between the adverse event and the exposed group. Statistical software used in our analysis was “R” Development Core Team Software (R.3.3.0., Vienna, Austria) and MedCalc software version 17.6 (MedCalc Software bvba, Ostend, Belgium). The result was considered statistically significant, if P < 0.05. A total of 105 PDC insertions done by surgical minilaparotomy technique qualified for analysis during the study period. A general surgeon inserted 43 PDCs (Group “S”), whereas a nephrologist inserted 62 PDCs (Group “N”). Detailed patient counseling and written consent preceded all PDC insertions. The distribution of cases between surgeon and nephrologist was done on the basis of availability of operating room initially, but later on all the PDC insertions were done by nephrologist in a dedicated operating room for nephrologist. There was no selection bias as both the groups included patients with previous abdominal surgery and obese. 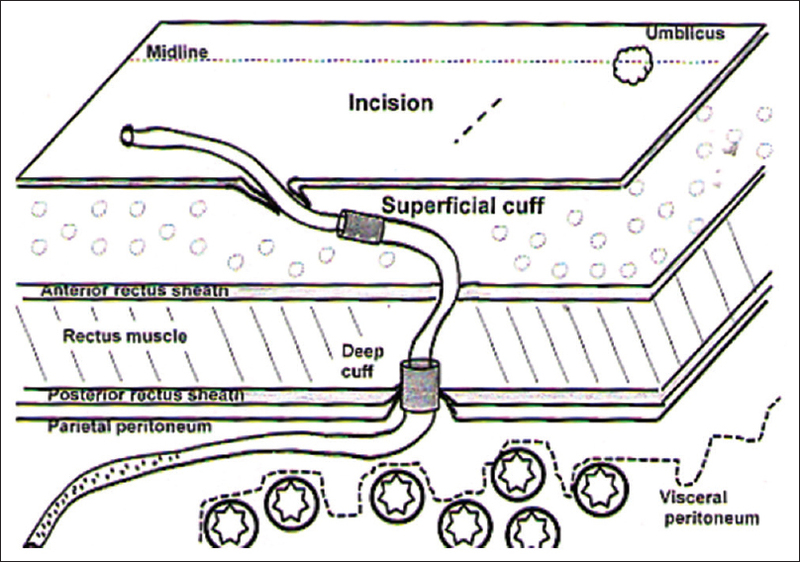 The differences in the operative technique used by both operators were limited to incision size, catheter exit at anterior rectus sheath and deep cuff placement. [Table 1]. The baseline characteristics between the two groups were comparable [Table 2]. The type of PDCs used was two cuff “straight” Tenckhoff PDC (41 cm) and two cuff “curl” (coiled) Tenckhoff PDC (57 cm). Hundred percent of patients in Group “S” and 59.7% in Group “N” underwent two cuff “straight” Tenckhoff PDC insertion whereas rest (40.3%) in Group “N” had two cuff “curl” PDC insertion (P < 0.0001). The type of PDC used for insertion depended on its availability in hospital. PDC was inserted in post-abdominal surgery patients by both operators (9.3% in “S” vs. 3.2% in “N”, P = 0.22) and obese patients were equally distributed in both groups. Majority of patients in “N” group belonged to rural areas (55% vs. 40%, Group “S”, P = 0.15). Mean break-in period was significantly shorter in “N” group (9.43 ± 1.04 vs. 12.36 ± 0.75 days, “S” group, P < 0.001) [Table 3]. One PDC had primary catheter nonfunction in “N” group due to early omental wrap, while there was none in “S” group. The mean catheter survival duration was slightly better in “S” group (18.63 ± 15.07 months vs. 16.73 ± 7.84 months, Group “N,” P = 0.08). Three-month catheter survival was comparable. Six-month catheter survival was lower in Group “S” (81.3% vs. 90.3%, Group “N,” P = 0.24). Patient follow-up at 1 year showed a significantly better catheter survival for Group “N” (85.5% vs. 58.1%, Group “S,” P = 0.001). At the end of the study period, “catheter survival, censored for patient death” (estimating catheter loss only) was better for Group “N” (69.3% vs. 53.5%, “S” group, P = 0.09). “Overall catheter survival” rates at the end of study favored group “N” (61.3% vs. 30.2%, “S” group, P ≤ 0.001) [Figure 4], the reason being a higher number of deaths at home with functioning catheter (P = 0.0001) in “S” group. Further analysis to attribute factors influencing catheter survival ruled out any association of catheter survival with prior hemodialysis (RR = 0.64, 95% confidence interval [CI]: 0.37–1.10, P = 0.71) or CRBSI (RR = 0.92, 95% CI: 0.5–1.69, P = 0.8) or diabetes (RR = 0.71, 95% CI: 0.36–1.39, P = 0.33). Patient survival at the end of study period (inclusive of surviving patients on CAPD and those on maintenance hemodialysis post-PDC removal) was better in “N” group (88.7% vs. 44.2%, Group “S,” P < 0.001) [Figure 5]. Group “S” had significantly higher deaths with functioning catheter, majority being due to deaths at home in rural areas (P ≤ 0.001), analysis of their death history pointed towards a possible cardiac event, and their inability to reach nearest health-care facility in time. There was no attributive relation between patient deaths, and prior hemodialysis (RR = 0.80, 95% CI 0.48–1.32, P = 0.39) or who had prior CRBSI (RR = 0.67, 95% CI 0.36–1.23, P = 0.19) or previous diabetes (RR = 0.78, 95% CI 0.44–1.38, P = 0.39). ”N” group had more mechanical complications (10 vs. 4 in Group “S,” P = 0.51), predominantly in postabdominal surgery and obese patients [Table 4]. Two patients in either group had catheter migrations, and both the migrated PDCs had to be removed in “N” group compared to single one removed in “S” group. Both groups had their share of injury to small branch of inferior epigastric artery during the minilaparotomy and managed it with free-tie application to bleeder and diathermy coagulation. “N” group had two rectus muscle hematomas, managed with re-exploration, evacuation of hematoma, cauterizing the muscular ooze, and placing deep sutures in rectus muscle by the nephrologist, though the surgeon colleague was on stand-by. Hemorrhagic outflow occurred in both the groups and was managed with rapid flushes and heparinization to prevent blocking of catheter pores. One patient developed left scrotal swelling after initiation of CAPD in “N” group, probably due to opening of/persistent processus vaginalis, and was followed by PDC removal. Peritonitis rates were comparable (1.087 and 0.791/1000 catheter-days in groups “S” and “N,” respectively, P = 0.21) and cumulative period until the first episode of peritonitis was 16,560 and 24,030 catheter-days for Group “S” and “N,” respectively. Two patients developed primary peritonitis in “S” group as against none in “N” group. Eleven patients suffered more than one episode of peritonitis (9.6%, Group “N” vs. 11.6%, Group “S”) and PDC removal due to refractory peritonitis was comparable (20.9%, Group “S” vs. 24.1%, Group “N,” P = 0.81) [Table 4]. Surgical placement of PDCs is a well-established procedure, usually done by surgeons. PDC insertions started as the surgeons' domain until Tenckhoff and Schechter  described a simplified percutaneous nonvisualized method of PDC placement in 1968. Surgeons have started laparoscopic PDC insertion due to safety and early CAPD rehabilitation., However, safety and success aspect of surgical PDC insertions is still unbeatable. With continued experience, operators develop new techniques for shorter break-in, lessen complications, and garner success (in terms of catheter survival). There are many publications comparing surgical and percutaneous PDC insertions,,,,,,,,,,,,,,,, but none is available comparing techniques and outcomes of surgical PDC insertion between surgeon and nephrologist. Ours is probably the first study to compare technique, technical survival, and outcomes of PDC insertion by surgical minilaparotomy done by surgeon and nephrologist. The highlight of our study is that obese and those with prior abdominal surgeries were also included in both groups, and there was no selection bias except one patient who required simultaneous umbilical herniorraphy (Group “S”). Surgical reputation of the operator is always at stake:First, for success of PDC implantation, lessen complications and early rehabilitation on CAPD, and second, during PDC removal. Implantation procedure itself has a direct impact on the ease of PDC removal later. In our study, Group “N” observed two major operative differences compared to Group “S.”First, deep cuff was placed at the level of anterior rectus sheath [Figure 2], and it aided easy PDC removal later without much tissue dissection or tissue trauma, whereas it was placed at posterior rectus sheath in Group “S” [Figure 1]. 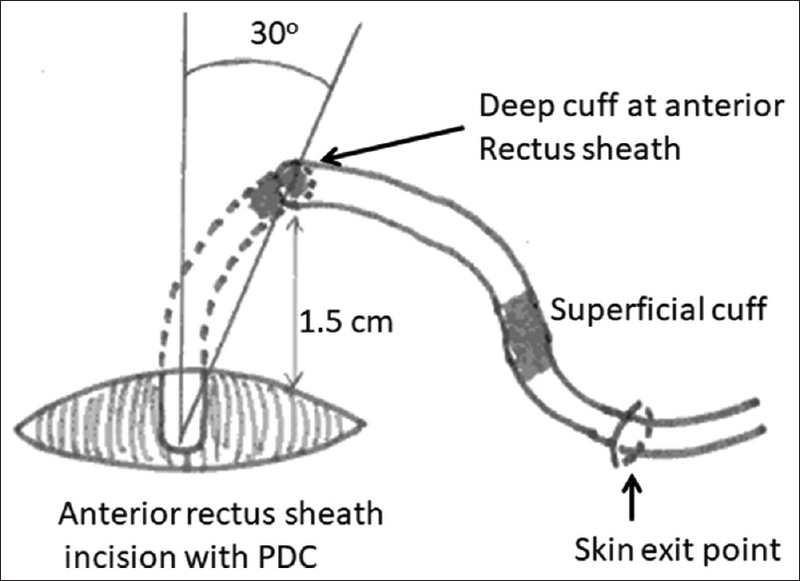 This method is different and more user-friendly than the usual surgical practice and the “best practices in performance of peritoneal catheter implantation” published by Crabtree where placement of deep cuff is below or within rectus muscle., Second, the PDC exit point at anterior rectus sheath in Group “N” was kept 1.0–1.5 cm cranial and laterally (angled approximately 30° to entry into the posterior rectus sheath) from anterior rectus sheath incision [Figure 3] compared to Group “S” where PDC exited from the lateral part of anterior rectus sheath incision. The advantage of this method is that it forms a naturally enhanced curve before entry into subcutaneous tunnel (no sling needed) as against the polypropylene sling used for forming curve in “S” group. In the event of PDC removal due to refractory peritonitis or other indications, “N” group encountered minimal fibrosis and resultant lesser tissue trauma to anterior rectus sheath by virtue of deep cuff placement at anterior rectus sheath or just above the rectus muscle. There was no need to suture posterior rectus sheath rent (0.5 cm) as healing of peritoneum usually occurs within 48–72 h and there was a negligible risk of omental or bowel herniation in this group. As compared, the PDC removal was laborious in Group “S,” as the deep cuff was adhered to posterior rectus sheath, and its approach through the rectus muscle encountered more fibrosis, requiring extensive dissection and resultant damage to rectus muscle. There was a risk of torrential bleeding (damage to inferior epigastric artery lying in the fibrosis). Furthermore, the dissection for accessing deep cuff left a comparatively larger gap in the posterior sheath and rectus muscle, which required mandatory suturing to prevent herniation of bowel and omentum after PDC removal. As on today, Chow et al. have published the largest data on surgical PDC insertion by a group of six nephrologists. In their 250 PDC insertions by surgical technique, they reported primary catheter failure rate as 2.8%, intraoperative bowel injury as 0.8%, omental wrap as 1.6%, and catheter occlusion with intraluminal clots as 0.4%. As compared, in the 62 surgical PDC insertions by nephrologist in our study, primary catheter failure was 1.6%, intraoperative bowel injury was 0%, omental wrap was 1.6%, and catheter occlusion with intraluminal clots was 0%, respectively. The 1- and 2-year catheter survival rates in our “N” group were 85.5% and 61.3% compared to 92.7% and 87.2%, respectively, by Chow et al. This was because of more number of refractory peritonitis-related PDCs removal (24.2% vs. 7.6% by Chow et al.) and further attributable to predominant rural residence of our study cohort. In addition, there was probable compromised hygiene sensitivity perception in our patients, humid climate, and heavy monsoon in eastern India. We compared our results with surgical PDC insertions by surgeons, world over. The immediate catheter survival (1 month) was good in both “S” and “N” groups in our study. Three-month catheter survival in our study was 100% in group “S” and 98.3% in group “N” compared to 77.0% in surgical group by Medani et al. 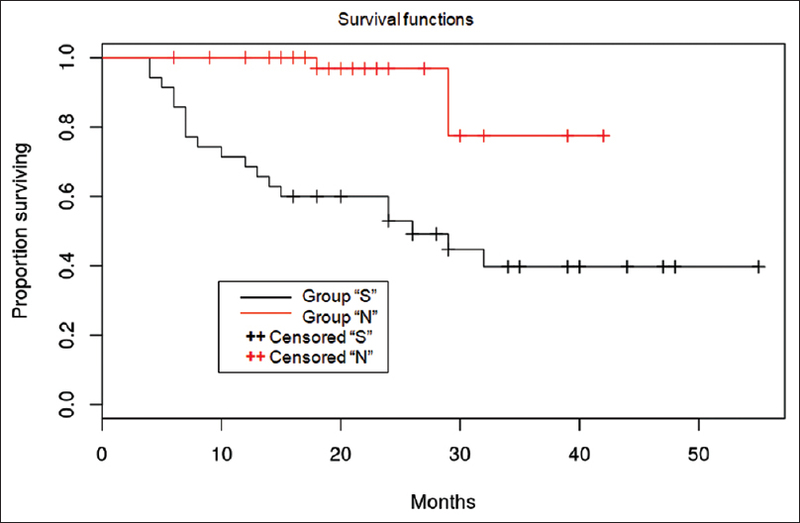 The 6-month death-censored catheter survival in our study was 81.3% and 90.3% in Groups “S” and “N,” respectively. 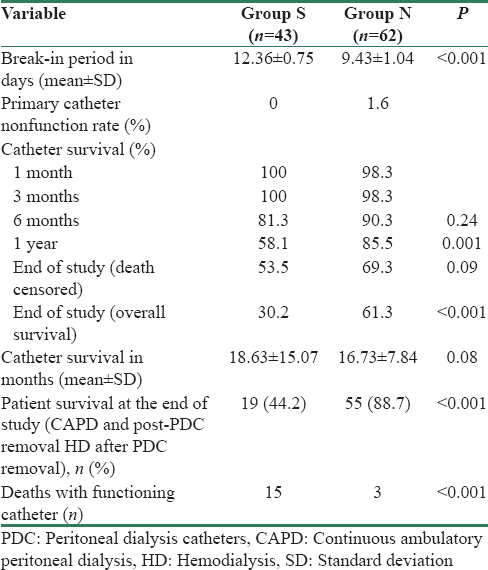 The 1-year catheter survival of surgical PDCs in our study was 58.1% for Group “S” and 85.5% for Group “N,” whereas it was reported as 93.3% by Park et al., 91.1% by Perakis et al., 82% by Ozener et al., 78.4% by Sivaramakrishnan et al., 68.7% by Medani et al., and 73% in a meta-analysis. Other studies have shown the 1-year catheter survival for surgical PDC insertions by surgeons varying between 41% and 75%.,,,,, Death censored catheter survival at the end of our study was comparable in both groups (53.5%, “S” group vs. 69.3%, “N” group, OR: 1.96, 95% CI: 0.87–4.40, P = 0.09) and was comparatively better than the surgical PDC insertions by surgeons.,,, Our study showed that the technical survival of surgically inserted PDCs by nephrologist was “noninferior” and comparable to those done by surgeons all over the world. The mechanical complication rates in our study was 16.1%, in “N” group versus 9.3% in “S” group (P = 0.51). Ozener et al. reported mechanical complications in 31% cases of surgical PDC insertion (5 - pericatheter leak, 2 - hernia, 14 - catheter obstruction, and 11 - catheter migration), leading to PDC removal in 16.1% cases. Park et al. showed 0% mechanical complications, whereas Medani et al. reported pericatheter leak in 6.8% and drainage failure in 11.7% cases. Tullavardhana et al. in a meta-analysis including two randomized control trials reported mechanical complications in surgical PDC group as 35.9% (pericatheter leakage in 12% and postoperative bleed in 4.4%). In India, AIIMS study  reported pericatheter leak in one patient and hemorrhagic outflow in one patient in the surgical group whereas Sampathkumar et al. reported nil complications in a numerically small surgical group. Chow et al. reported bowel injury in 0.8% cases, whereas there was no bowel injury in our study despite operating on postabdominal surgery and obese cases. In these special cases, the peritoneal incision was slightly bigger (1.0–1.5 cm), to do an adequate analysis of bowels and approach adhesions. Two patients in “N” group had adhesions and were broken with gentle dissection with the tip of finger. There was no PDC blockage due to blood clots despite hemorrhagic outflow in two patients because of locking of PDC with heparin immediately after implantation. The rate of mechanical complications in surgical PDC inserted by nephrologist in our study was slightly more than that by the surgeon but lesser as compared to surgeons in various studies quoted above. These complications did not have any adverse effect on catheter performance and catheter or patient survival. The hemorrhagic complications and their management have been delineated in the results section above. It can be safely deciphered and re-iterated that the surgical insertion of PDCs by nephrologist with adequate training and experience is noninferior to those done by surgeons and can yield better results. This is achievable by adequate training, following of proper safety procedure while operating, and improvisation of technique without hurrying into finishing the surgery. CAPD peritonitis, a preventable complication served as an important determinant of success of CAPD program in all parts of the world. The peritonitis rates in both groups in our study were comparable (1.087, “S” group vs. 0.791/1000 catheter-days, “N” group, P = 0.21). Sivaramakrishnan et al. 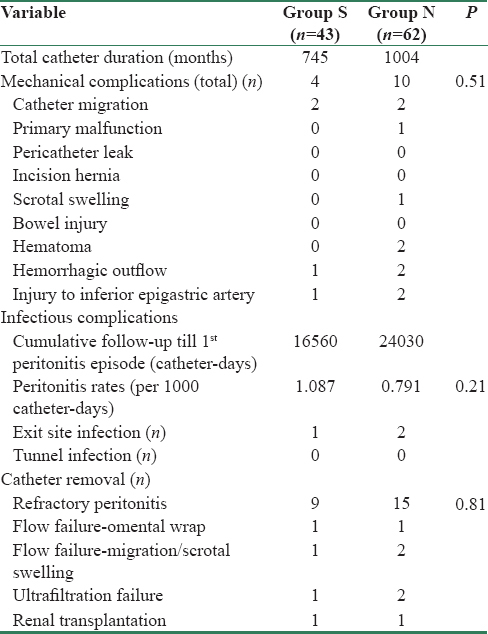 reported peritonitis rate as 1.7/1000 catheter-days. Ozener et al. reported peritonitis rates as 1/17 patient-months and 23% of PDCs removed due to refractory peritonitis, while Medani et al. reported it as one in 19 catheter-months with early peritonitis (<1 month) in 7.4% of the patients. The overall infectious complications were 42.6% in a meta-analysis, 13% by Henderson et al., and 42% by Rosenthal et al. Refractory peritonitis was the most dreaded infectious complication and the main reason for maximum PDC removals in our study group. Our study was an observational retrospective analysis of surgically inserted PDCs by surgeon and nephrologist. The strength of this study was the inclusion of obese and post-abdominal surgery patients in both groups, thereby ruling out any selection bias. The nephrologist was trained in surgical insertion; hence, all complications were managed by him, though the surgical colleagues were available as a back-up As should always be in any CAPD insertion procedure (percutaneous or minilaparotomy). The limitation of this study was that the number of patients was less and it was a retrospective analysis. The results of our study show that surgical PDCs insertion by nephrologist was noninferior to those by surgeons and had a better technique survival. The technique used by nephrologist was practical and aided in easy removal of PDC in the event of technical or mechanical failure. Mechanical complications were minimal, though slightly more in nephrologist group, but were adequately managed and none of them caused any fatality or catheter loss. Technique and patient survival of surgically inserted PDCs by nephrologist was better. The technique used by nephrologist to form a natural curve of the PDC is simple and innovative and it also helped easy removal of PDC at later stage. Ozener C, Bihorac A, Akoglu E. Technical survival of CAPD catheters: Comparison between percutaneous and conventional surgical placement techniques. Nephrol Dial Transplant 2001;16:1893-9. Perakis KE, Stylianou KG, Kyriazis JP, Mavroeidi VN, Katsipi IG, Vardaki EA, et al. Long-term complication rates and survival of peritoneal dialysis catheters: The role of percutaneous versus surgical placement. Semin Dial 2009;22:569-75. Medani S, Shantier M, Hussein W, Wall C, Mellotte G. A comparative analysis of percutaneous and open surgical techniques for peritoneal catheter placement. Perit Dial Int 2012;32:628-35. Medani S, Hussein W, Shantier M, Flynn R, Wall C, Mellotte G, et al. Comparison of percutaneous and open surgical techniques for first-time peritoneal dialysis catheter placement in the unbreached peritoneum. Perit Dial Int 2015;35:576-85. Sampathkumar K, Mahaldar AR, Sooraj YS, Ramkrishnan M, Ajeshkumar RM, Ravichandran R, et al. Percutaneous CAPD catheter insertion by a nephrologist versus surgical placement: A comparative study. Indian J Nephrol 2008;18:5-8. Sampathkumar K, Ramakrishnan M, Ajeshkumar RN, Sah AK, Ravichandran R. Percutaneous CAPD catheter insertion by nephrologist – A single centre experience over 4 years. Indian J Perit Dial 2010;18:158. Sivaramakrishnan R, Gupta S, Agarwal SK, Bhowmik D, Mahajan S. Comparison of outcomes between surgically placed and percutaneously placed peritoneal dialysis catheters: A retrospective study. Indian J Nephrol 2016;26:268-74. R Development Core Team. R: A Language and Environment for Statistical Computing. Vienna, Austria: R Foundation for Statistical Computing; 2016. Available from: http://www.R-project.org/. [Last accessed on 2016 Oct 25]. MedCalc Statistical Software Version 17.6. MedCalc Software bvba, Ostend, Belgium; 2017. Available from: https://www.medcalc.org; 2017 [Last accessed on 2017 Jul 15]. Tenckhoff H, Schechter H. A bacteriologically safe peritoneal access device. Trans Am Soc Artif Intern Organs 1968;14:181-7. Crabtree JH, Burchette RJ. Effective use of laparoscopy for long-term peritoneal dialysis access. Am J Surg 2009;198:135-41. Schmidt SC, Pohle C, Langrehr JM, Schumacher G, Jacob D, Neuhaus P, et al. Laparoscopic-assisted placement of peritoneal dialysis catheters: Implantation technique and results. J Laparoendosc Adv Surg Tech A 2007;17:596-9. Park YS, Min SI, Kim DK, Oh KH, Min SK, Kim SM, et al. The outcomes of percutaneous versus open placement of peritoneal dialysis catheters. World J Surg 2014;38:1058-64. 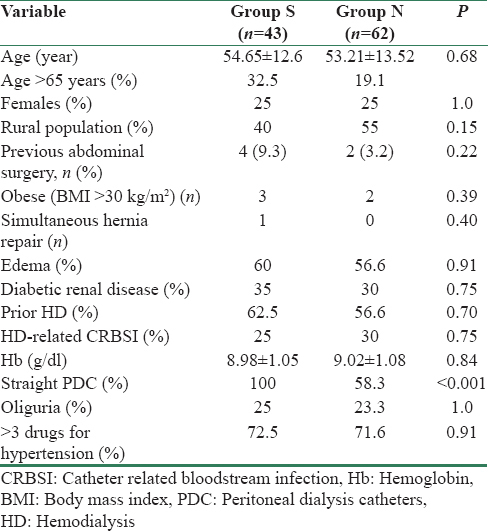 Tullavardhana T, Akranurakkul P, Ungkitphaiboon W, Songtish D. Surgical versus percutaneous techniques for peritoneal dialysis catheter placement: A meta-analysis of the outcomes. Ann Med Surg (Lond) 2016;10:11-8. Mellotte GJ, Ho CA, Morgan SH, Bending MR, Eisinger AJ. Peritoneal dialysis catheters: A comparison between percutaneous and conventional surgical placement techniques. Nephrol Dial Transplant 1993;8:626-30. Henderson S, Brown E, Levy J. Safety and efficacy of percutaneous insertion of peritoneal dialysis catheters under sedation and local anaesthetic. Nephrol Dial Transplant 2009;24:3499-504. Roueff S, Pagniez D, Moranne O, Roumilhac D, Talaszka A, Le Monies De Sagazan H, et al. Simplified percutaneous placement of peritoneal dialysis catheters: Comparison with surgical placement. Perit Dial Int 2002;22:267-9. Liberek T, Chmielewski M, Lichodziejewska-Niemierko M, Renke M, Zadrozny D, Rutkowski B, et al. Survival and function of tenckhoff peritoneal dialysis catheter after surgical or percutaneous placement: One centre experience. Int J Artif Organs 2003;26:174-5. Crabtree JH. Peritoneal dialysis catheter implantation: Avoiding problems and optimizing outcomes. Semin Dial 2015;28:12-5. Chow KM, Szeto CC, Leung CB, Kwan BC, Pang WF, Li PK, et al. Tenckhoff catheter insertion by nephrologists: Open dissection technique. Perit Dial Int 2010;30:524-7.